on the slope behind the bench. tickles your ankles if you walk too close. When Rudell and Jay Hegnes moved into their Gig Harbor home in 2004, they faced a steep bank across their backyard and soggy clay soil that wouldn’t drain. Most homeowners would have considered the hill an obstacle in their landscaping plans. “We knew the steep bank could be an asset by adding top soil and layering conifers and shrubs up the bank,” Rudell Hegnes said about the first time the couple looked at the elevation changes. With seven gardens already under their belt from previous homes, they had no illusions that the landscaping would be an easy task, and they dug in to create their new garden paradise. The Hegnes did most of the work themselves. 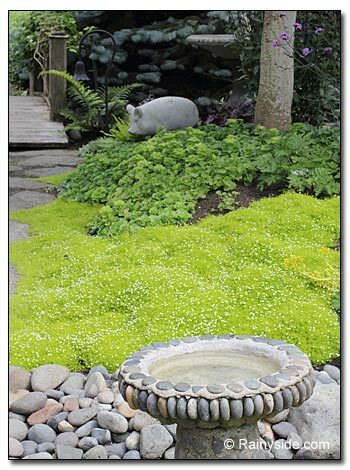 The only professionals they hired to help were a rock company that brought in large boulders and set them into place about the garden. The rest of the landscape came from the strength of a couple determined to bring their new garden to life. First, they installed a French drain to channel the water out of the garden. They then brought in 10 dump-truck loads of five-way mix of topsoil to make a gentler slope that was more manageable. Next, they brought in six dump-truck loads of compost to help improve the clay soil. Every other year they continue to amend their soil with MooDoo, an organic soil amendment they purchase from Erin Rockery in Gig Harbor. Hegnes chuckled when she called her husband the human bulldozer. “He can move two truck loads of MooDoo in one day,” she said. The soil improved from soggy clay dirt to humus-rich, friable soil that is teaming with life. “Even when we bring in the MooDoo, the compost is full of worms,” Hegnes explained. It is fertile enough that she doesn’t need to fertilize her plants. “The soil is teaming with life,” she said. 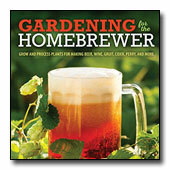 In addition, it shows in the health of every plant she grows in the garden. They layered their hillside with shrubs and conifers that brought privacy, and made their quarter-acre garden appear larger. Although Hegnes doesn’t have a design background, a barren landscape is a canvas for her creative talent. You cannot view the whole property at once — she designed the garden to take you on a journey through rooms and small vistas. To appreciate the space fully, you must walk through the entire garden. Hegnes loves to create vignettes throughout their small space, so every turn of the corner brings another one into view. 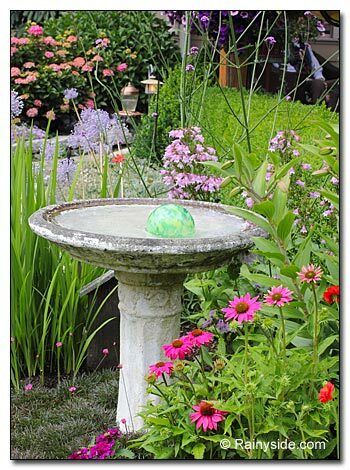 She repeats the same plant material and echoes color to each section of the garden so it transitions gracefully from one area to the next. 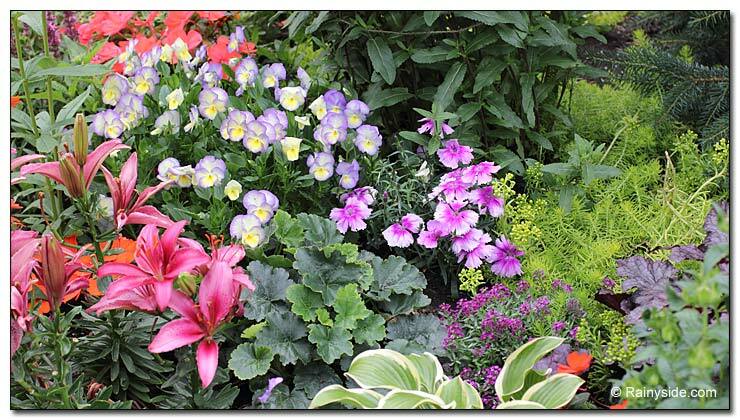 Their love for gardening and plants shows in their diverse plantings. 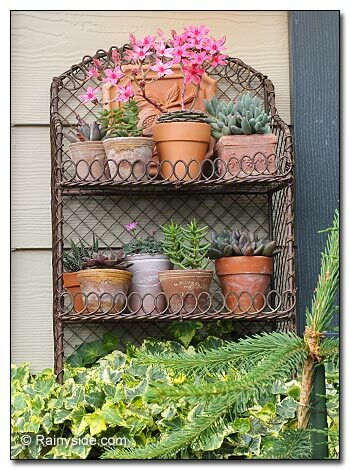 “We love to garden for many reasons. One is the anticipation during the winter months to see how everything emerges in the spring. 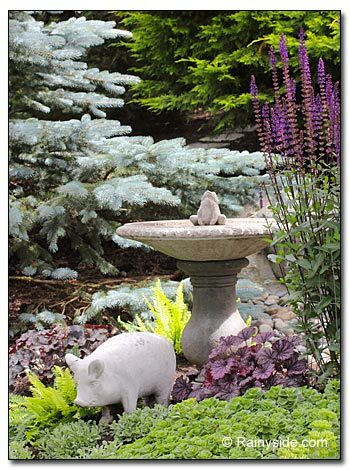 Helping the trees, shrubs and perennials work well together with pruning and shaping,” Hegnes said. 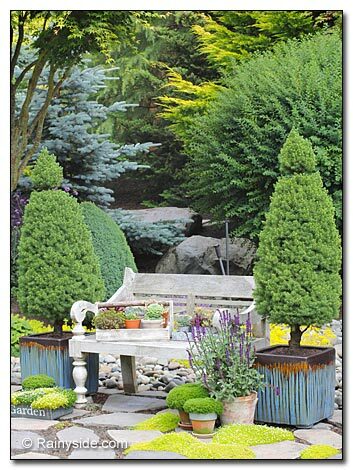 She likes the combination of a tightly clipped background, which surrounds or behaves as a backdrop to loose plantings. “It helps keep an area from looking messy,” she explained. Jay takes care of the shrubs and trees and the heavy work, while Rudell takes care of the perennials and annuals. “I feel spoiled,” she said. 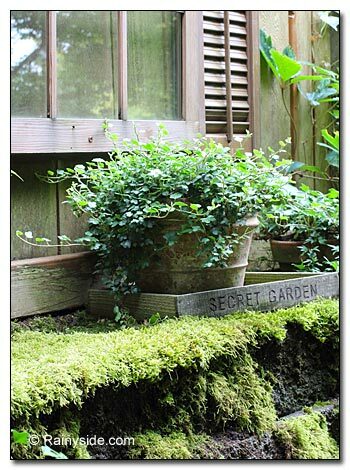 When you walk through one of the side gardens, it’s not just a cobble-paved path to a backyard; you know you are entering a special place that is meant to be savored in a slow stroll. The tree-lined garden is filled to overflowing with shade-tolerant plants such as a Hydrangea 'Mother Theresa' on the hill, and astilbe, tiarella and other shrubs and perennials line the walk. 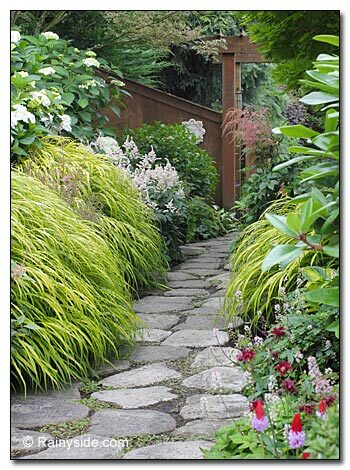 A wall of Japanese forest grass (Hakonechloa) cascades down to the cobblestone path and tickles your ankles if you walk too close. Up ahead a gate with a wire basket of flowers beckons you to continue. 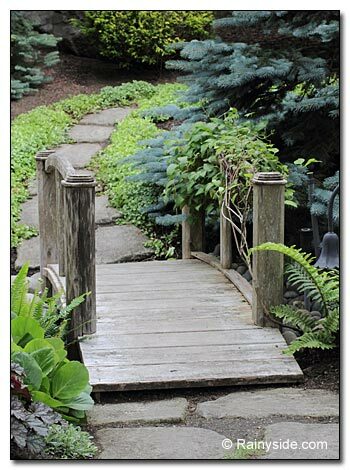 As you step through the gate, you have a choice of turning toward the level area of the garden or walking up a set of flagstone steps that is surrounded by textures of various groundcovers. Up the steps, you ascend into the trees and shrubs. “When we chose our plants, we wanted to buy shrubs and trees that wouldn’t overtake others. With good soil, our mostly 5-gallon-size tree purchases took off and grew quickly after the third year in the ground,” Hegnes said. After 10 years, the trees look like they’ve been there a long time. They studied the garden for a while and realized the Japanese maples is what made it so beautiful. 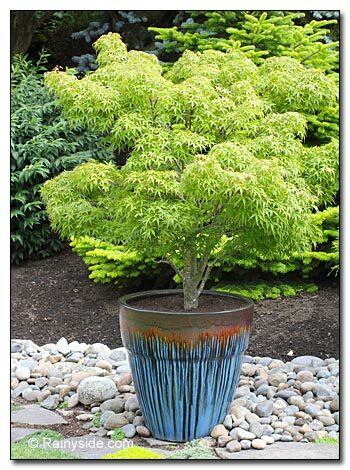 The couple also incorporate maples and grow a handsome Acer palmatum 'Sharp’s Pygmy' in a decorative blue container. Considered one of the smallest maples of the palmatums, it has remarkable fall color too. One of Hegnes’ favorite plants in her garden is the lacy foliage and beautiful flowers of Thalictrum 'Meadow Rue' and 'Black Stockings.' She uses Hydrangea 'Pia” and Campanula 'Birch Hybrid' extensively in the garden. 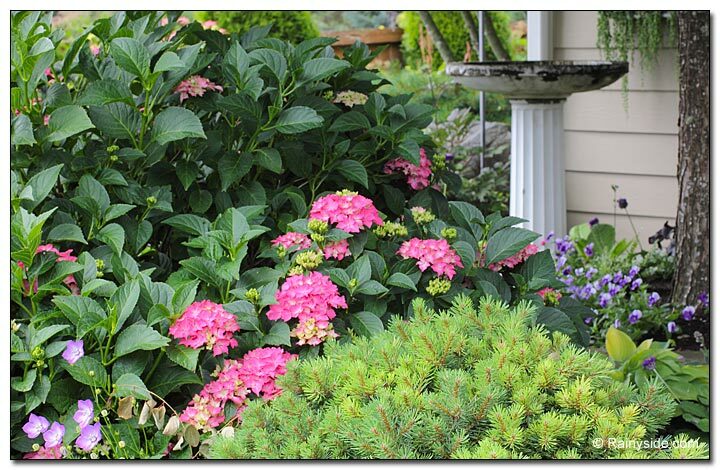 “It (the hydrangea) stays small and has a long bloom time,” Hegnes said. They both love spruce not only for their evergreen presence, but also for their color and shape. Many features dot the garden. A bridge spans the French drain disguised as a dry-creek bed. 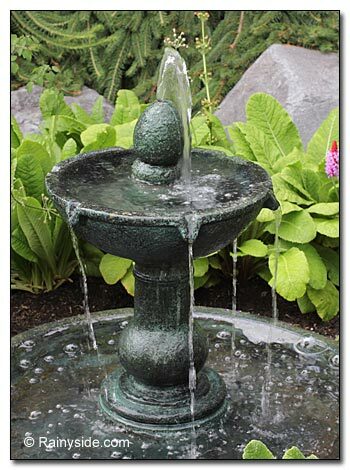 Birdbaths and fountains are found throughout the garden. Hegnes utilizes a 6-by-6-foot greenhouse to start her hanging baskets in April and for wintering overtender plants. She also uses the space for propagation of plants such as sowing a few annuals from seed, and rooting cuttings. 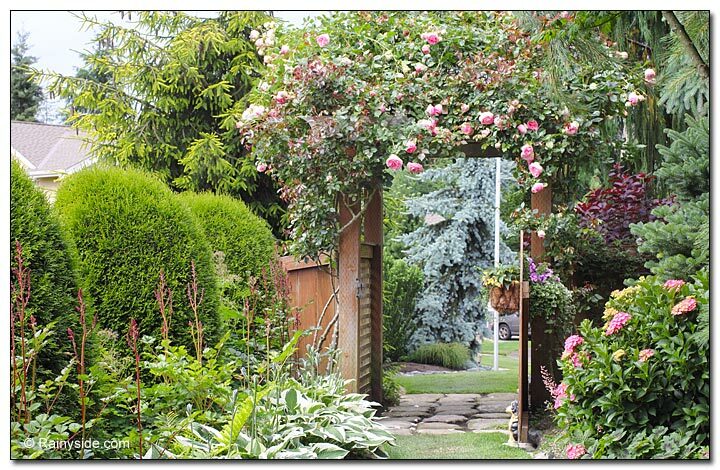 They share their garden with others and opened their garden several times for the Gig Harbor Garden Tour, including the most recent one this past in June 2014. 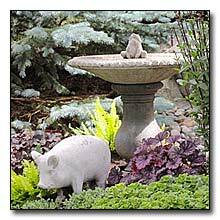 (Right photo) One special piece in the garden is an old concrete birdbath from Jay’s youth. There is a photo of him kneeling in it when he was eight years old. A rose (Rosa ‘Eden’) covers the gateway, which marks a transition from the front garden to the back. Clipped arborvitae back drops the looser plantings of hostas. 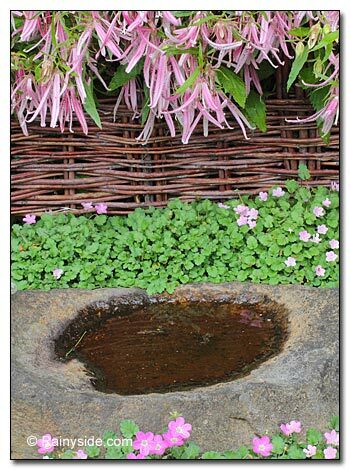 (Photo left) A bellflower (Campanula ‘Pink Octopus’) hangs over a rain catcher rock surrounded by a heronsbill (Erodium chamaedryoides). 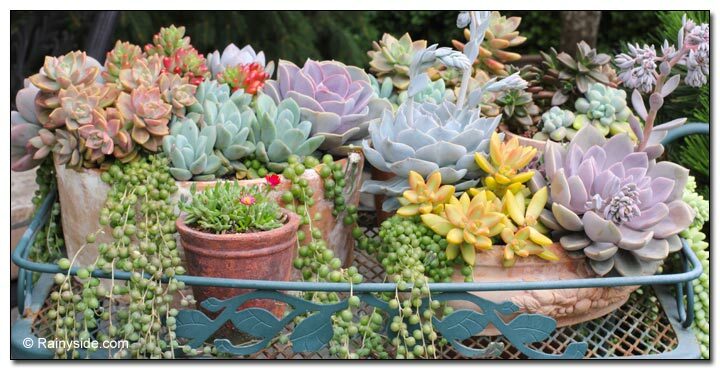 (Photo right and below) Containers of succulents. (Photo left) A secret path leads up to the top of the slope where a hidden area is revealed. 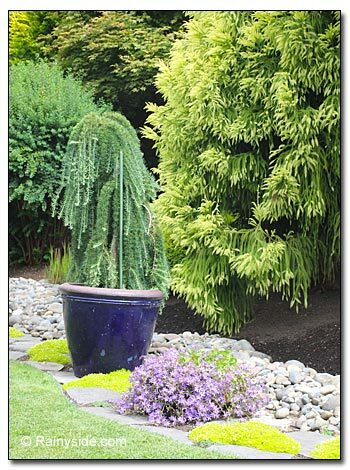 (Photo right) Acer palmatum ‘Sharp’s Pygmy’ in a large pot sits in front of the dry stream bed that hides the French drain. 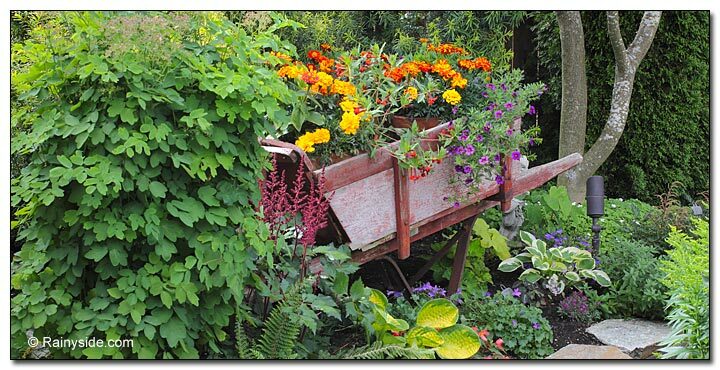 A wooden wheelbarrow—planted with colorful annuals and tender plants—came to live in their garden after going on a garden tour Rudell and her brother saw a wooden one in a garden. Her brother found one for her on Craig’s List. Garden filled with an array of shrubs, perennials, annuals, and bulbs.